In all the hullabaloo about the EU's rejection of the Chequers proposals, one little detail has been forgotten: The Chequers proposals were never going to be part of the Brexit agreement in the first place. If agreed, they would have been part of the proposals for the future relationship between the EU and UK - as contained in a non-binding "Political Declaration" - to accompany the legally binding Brexit agreement. The Brexit agreement itself is concerned mainly with the UK's exit payment, the treatment of EU nationals in the UK and UK nationals in the EU, and with the back-stop on the Irish border. According to all parties, that Brexit agreement has been 90% agreed, and the UK even signed up to the EU's outline proposals on the backstop in December 2017. Theresa May only got cold feet on the deal in March 2018 when the EU produced a legally enforceable text which defined how it would work in detail. [Pages 108-116 of attached draft Brexit Agreement (PDF)]. Realizing that a failure to secure full access to the EU Customs Union and Single Market would result in some kind of customs or regulatory difference and therefore control requirements between Great Britain and N. Ireland, she caved in to DUP pressure and declared no British Prime Minister could ever agree to this. Except she already had agreed to it (in principle). So the row over the EU rejection of the Chequers proposals (which had already been killed off by internal Tory party opposition before they ever got to Salzburg) is nothing but a red herring to distract attention from her real difficulty with the DUP. The political declaration to accompany the formal Brexit Treaty can be as vague or aspirational as she likes, referencing Chequers, Norway or Canada +++, but whatever it contains is not legally enforceable and won't be agreed in detail until towards the end of the transition period in any case. Fintan O'Toole sees a dark conspiracy in all of this. Realizing that the EU proposals would give N. Ireland free and full access to the EU Customs Union and Single market (CUSM), May saw an opportunity to use this as a means of retaining full access to the CUSM for the UK via the back door of N. Ireland. Suddenly the prospect of having any kind of controls between N. Ireland and Great Britain became absolute anathema. Never mind that controls on agricultural products and animals already exist, and the fact that N. Ireland already diverges starkly from Great Britain on matters like abortion services, marriage equality, and recognition and protection of minority languages. When both the EU and many in the Tory party rejected this ruse, on the grounds that continued membership of the CUSM would restrict the UK's ability to control immigration, negotiate its own trade deals with third parties, and reduce the UK to being a "rule taker" of EU rules it had no power to control, May produced her "compromise" Chequers proposals which restricted membership of CUSM to products and excluded services. This compromise, too, was rejected by many in the Tory party (and the wider public) on the same grounds as before - as effectively turning the UK into a vassal state. It should not have been any great surprise to anyone when it was also rejected by the EU, on the grounds that you cannot "cherry pick" the parts of the CUSM you like. So why the big row? It all began to unravel at May's breakfast meeting with Varadker prior to the summit where May indicated that the UK's counter proposals to the EU's text on the backstop would not be available for quite some time to come. The EU had been preparing "to be nice" to May ahead of the Tory party conference, in the expectation that May would deliver on her earlier commitments on the backstop shortly thereafter. Instead May penned a hardline op-ed in Die Welt on the eve of the summit, one which she repeated almost verbatim in a speech to EU leaders at the Summit dinner. It's hectoring and moralizing tone was too much for some leaders, particularly Macron, to take. The following day they responded in kind. But let us not be taken in by this exercise in kabuki theater. The precise shape of the UK's ongoing trading relationship with the EU won't be contained in the Brexit agreement in any case. This is a matter which cannot and need not be resolved now. What matters in the conclusion of the final 10% of the formal Brexit agreement, and this includes above all, the legal wording to give effect to the backstop deal on the Irish border May had already agreed to. Anybody who was surprised by the latest episode of Brexit psychodrama simply hasn't been paying attention. The template for negotiations was set within hours after the June 2016 referendum: the European Union sets out its stall and waits for the British response. As soon as UK prime minister Theresa May's `red lines' became apparent, the EU could legally and logically offer only one of two routes: Canada or Norway. Each time this is politely repeated, the UK cabinet and the rest of the Conservative Party pay little attention to what Brussels says, choosing instead to have a row among themselves. This little two-step has been repeated many times. After each Tory party row, when someone says something like "the EU can go whistle for its money", the British return to the negotiating table with some new concessions and a slightly shorter list of impossible demands. The whole process will get repeated until that list is small enough for Brussels to start negotiating. We are almost there. That list of impossible demands is actually quite short but, on the face of it, irreconcilable: no borders in Ireland or down the middle of the Irish Sea. Part of the psychology of all this is the importance attached to high dudgeon. It is vital that members of the British cabinet takes turns to get very upset, if not angry at some imagined insult from Brussels. It almost looks choreographed. If a moral high horse is spotted somewhere in the distance, great effort is expended to climb upon it. It is vital that tabloid newspaper editors are given the opportunity to write headlines in a style not seen since the sinking of the Argentinian General Belgrano during the Falklands war. Everything is a "shock" or a "blow". Or, more latterly, May's "finest hour", the latest in a long line or Churchillian, wartime, references. I'm not sure why it has to be this way: trying to understand what basic human needs are satisfied by this kind of behaviour leads to another form of madness. But the results are clear. One consequence is an erosion of faith in the British as capable and efficient administrators. Another is the evisceration of trust: any agreement, free trade or otherwise, can only ever be negotiated between parties who trust each other. There has been plenty of British backsliding but the signing last December of the Border backstop deal, followed by an immediate effective breach of contract, has been quietly noticed everywhere. In all the hullabaloo about the EU's rejection of the Chequers proposals, one little detail has been forgotten: The Chequers proposals were never going to be part of the Brexit agreement in the first place. If agreed, they would have been part of the proposals for the future relationship between the EU and UK - as contained in a non-binding "Political Declaration" - to accompany the legally binding Brexit agreement. So the row over the EU rejection of the Chequers proposals (which had already been killed off by internal Tory party opposition before they ever got to Salzburg) is nothing but a red herring to distract attention from her real difficulty with the DUP. If Theresa May wants to regain the trust of EU negotiators and achieve a Brexit deal, all she has to do is actually deliver on what she promised last December: a legally enforceable backstop which ensures that a hard border will never be required in Ireland. Statement from HM Government, ("Chequers proposal"), 6 July 2018, 3 pp. This document is not a draft treaty, draft A50 settlement agreement(contract), or even another premature "future partnership" (trade) positioning paper. It is a Conservative Party "manifesto" (May's unfortunate term) addressed to party members. More important is explanatory information about customs controls that obviate any need for observing antiquated notions of literal, physical border patrol. d. The UK and EU would work together on the phased introduction of Facilitated Customs Arrangement that would remove the need for customs checks and controls between the UK and EU as if a combined customs territory. The UK would apply the UK's tariffs and trad policy for goods intended for the UK, and EI's tariffs and trade policy for goods intended for the EU -- becoming operational in stages as both sides complete the necessary preparations. This would enable the UK to control its own tariffs for trade with the rest of the world and ensure business paid the right or no tariff - in the vast majority of cases upfront,and otherwise through a repayment mechanism. To be charitable, this information does not endorse either "special" EU zoning for NI or dissolution of the UK union. (Nor smuggling --customs evasion-- which most certainly will occur as always.) It endorses port control of goods entering and exiting the both jurisdictions. That is not news or a fantastic breach of UK sovereignty. May acknowledges application to "world" trade customs surveillance and tariff collections. The equipment already exists. Manufacturers already apply RFID, UPC, and EAN scannable ID to variable weight merchandise and livestock. Use of this technology is ubiquitous. Objection to merging commercial and public data sets in order to utilize this technology at ports --whether perfected or not at launch-- is bogus. EU has indicated, comically, it doesn't care as long as UK commits to the A50 agreement. This document conveys no legal effect on the EU gov. Let's not dramatise--as British and Irish press do-- that it does or that its content is comparable to negotiable terms of any A50 conclusory agreement or that is represents a counter offer. The conclusion of this story is not complicated. I'm not sure we're disagreeing on anything here. Whatever future trading relationship is agreed, it will not be agreed until the transition agreement after completion of the Brexit Treaty. There are a number of reasons why the EU (as well as many in the UK) reject the Chequers proposals, but that simply isn't the problem right now, which is to conclude a Brexit deal including a legally operable backstop guarantee that no future arrangements will be entered into which would require a hard customs border within Ireland. Precisely how that will be achieved can be a matter for another day. May says that it is now up to the EU to produce a working alternative to her Chequers proposals. That can be done in due course, but won't be included in the Brexit Treaty in any case. But if she wants a Brexit deal to create that opportunity, she must first agree the backstop. And if she doesn't like the EU draft, it is up to her to come up with a better one. Chequers is a red herring. But there's no mystery here. The EU did not reject the "Chequers proposal", because it is not a declaration of regulatory procedures in itself (the "backstop" expected). It's a Tory "manifesto" and articulates a profoundly devious political posture to the problem of UK-EU port customs controls. Because Tory gov's latest pretext for caring about the GFA, a semblance of an actual "backstop" proposal was delivered the month before. Wherein Tory gov demands tariff-free trade for the whole UK, rejects custom control of any sort, and requires liberty to enter FTAs with rest-of-world. The tech solution is the EU's effort to develop one of Tory gov's dodges from last year. Only god knows what tripe May slipped Macron in August. Anyone should see why Tory members rejected the "Chequers proposal". May had the nerve to convey from EU a joint EU-UK custom controls on the Big Island and NI. Also they're assholes. (1) "the EU could legally and logically offer only one of two route: Canada or Norway." (2) "either the EU gives way on the freedom of movement of people, or the British accept the Irish Sea border." We're not even sure a capitulation on FOM would bring about the desired result (Norway light?). People like Nick Clegg think a 'compromise' on FOM as a good will gesture could stop Brexit in a second referendum. I think that's delusional. As they say: appeasement doesnt work. No one gave a toss about Cameron's deal on FOM, they won't start caring now. EU is not going to offer anything until Tory gov co-signs the A50 settlement agreement --stipulating conditions of UK trade priveleges. Before 31 October. Tory gov has been out of order on Lisbon provisions since Day 1. And they just won't quit pumping out the "future partnership" position litter. In plain English, this would mean we'd still have to abide by all the EU rules, uncontrolled immigration from the EU would continue and we couldn't do the trade deals we want with other countries. Mind you, the UK Withdrawal Bill repealed the ECA. I deeply regret that the Scottish Parliament felt unable to give consent to the EU (Withdrawal) Act. To the very end we worked constructively with the Scottish Government to try to reach agreement, making significant changes to the legislation. Throughout, the UK Government upheld our commitment to the devolution settlement. (1) The UK red lines changed. At first Norway was widely debated as a possible preferred option. When the EU reiterated that the 4 freedoms were indivisible, Canada+++ (whatever that is) becomes the only logical option, but Chequers does not acknowledge this. (2) If the EU were to allow some restrictions on the free movement of people, thus enabling the UK as a whole to remain in the Single Market, that would reduce the need for a border in the Irish sea - although it should be noted there is still a customs border between Norway and Sweden because Norway is not in the Customs Union. So (a) it wouldn't solve the problem, and (b) it might require changes to the Treaties governing the Single Market and thus a referendum in Ireland. Chris Johns dooesn't argue this, he merely observes that the limited scope of the proposed Brexit Treaty postpones all the really difficult decisions until later, and doesn't guarantee there will ever be an agreement on future trade relations, whether some variant on Norway or Canada. Many Brexiteers are clear they don't want either - they are happy with WTO rules. They don't seem to have noticed that Trump has rendered the WTO all but irrelevant and perhaps defunct. The problem is Tory gov will not sign an A50 settlement. They can bloviate all they want in a "future partnership" but those terms will not be in the A50 settlement. They know that. Deep down you know that. The difference between us is I. don't. care. what Tory gov wants in the future. I wouldn't turn my back on a one of them in broad daylight. UK's second largest trading partner in the EU. 'I am still confident that we can come to an agreement this year and the Chequers proposal is helpful, but it is not the outcome,' Rutte said. In Tuesday's budget presentation it emerged the government has set aside an extra 100m to prepare the Netherlands for Brexit. This includes the appointment of 900 new customs officials plus product safety inspectors. Is Rutte to be trusted? The Dutch are phenomenally efficient busting drug smugglers, or so goes the news. No, not to be trusted on any matter! Foreign policy is aligned with the AngloSaxon alliance of NATO-USA-UK ... Mark Rutte repeats verbatim whatever the State Department spokesperson in the US states. In the aftermath of accidental downing flight MH-17 above the warzone in Ukraine that was clear from the very beginning. Hollow words ... listen to him! It was sadly appropriate that Denis Norden, the star of the British television show It'll be Alright on the Night, died in the same week as the EU's Salzburg summit took place. The working assumption of many in Britain has been that the Brexit negotiations will ultimately "be all right on the night". The national philosophy of muddling through will prevail once again. After all, national humiliations and catastrophes only happen to people who are unfortunate enough to live on the other side of the Channel. Salzburg delivered a serious blow to this kind of complacency. It is becoming increasingly clear that the Brexit negotiations could indeed fail. Both the EU and the UK are now talking seriously about the threat of "no deal"- with Britain simply crashing out of the EU in March. Jeremy Hunt, Britain's foreign secretary, has warned the EU not to misread the situation, by under-estimating Britain's strength of will. But, in reality, it is the UK government that has consistently miscalculated during the Brexit negotiations - by over-estimating the strength of its hand. If this persists, I fear that Britain is heading towards what counsellors call a "teachable moment", otherwise known as a traumatic experience that forces people (or nations) into a fundamental reassessment. The UK has experienced similar moments in the postwar period. The failed Suez invasion of 1956 was a mortification that underlined the fact that Britain was no longer an imperial power. Calling in the IMF in 1976 was a humiliating illustration of the UK's economic weakness. A Brexit debacle could lead to another painful moment of realisation, highlighting the practical limitations on British national sovereignty. Excellent commentary, but also somewhat naive. In reality the EU position (no less than the British) is constantly evolving, and Brexit is an excellent opportunity to lay down some lines in the sand - to discourage any others - and to fortify what might have been some shifting sands in the past. It's not purely about power, it's also about self-preservation, and here the EU has as much to lose as the UK. Brexit provides a wonderful opportunity to show unprecedented unity of purpose, at a time when there is much for the EU to be dis-united about. It provides a wonderful illustration of the benefits of membership, at a time when some recalcitrant members may be tempted to threaten to leave. After the UK's experience, it will be a very long time before any member, however unhappy, will be tempted to trigger A.50. It's like shooting yourself in the foot, when your original problem was but in your big toe. Greece may still be feeling humiliated by it's treatment by the EU, but it will have nothing on the humiliation felt by the UK by the time the EU is finished with it. Gideon must of course express some sympathy for the UK's complaints of Commission "inflexibility", but it is in reality nothing more than the rigorousness required of an institution set up by Treaty by 28 Sovereign states and which requires a consensus by 27 to proceed. Do the British really want to be held hostage to a referendum in Ireland required to change some aspect of the Single market or Customs Union to which they themselves signed up as a member? The amateurishness of the UK government's approach defies belief and almost guaranties an catastrophic outcome. The EU simply has no one competent to negotiate with and hasn't had to depart from its opening positions. Suez mark II is a kind description. the problem being that Suez has been all but edited from history as UK public and politicians understand it. Everything is still Churchill gruffly declaring, "Very well then. Alone !!" with only the memory of the victory 5 years later to vindicate him. They forget that, at that stage of the war, we were losing. And losing badly. Dunkirk was still the final humiliation of a chaotic defeat in France rather than the plucky rearguard action mythology later painted it. The Atlantic convoys were being sunk wholesale. My FB timeline is filled with rah rah screeds about Britain having saved Europe in WW2. How we won the falklands while giving the world rock and roll. Realistic or even moderately optimistic assessments of our post-EU futue simply do not feature. Because for convinced Brexiteers, its not about economics. It's about national pride. It's about once again being a major power in the world in your own right - dealing with the EU and other major powers as an equal. It's about forgetting that winning WWII was only possible with US and Soviet assistance. It's about forgetting the EU's role in helping the UK remain the 5th. largest economy in the world. It's about English being the lingua franca of the world. It's about Queen and country, the Commonwealth, about Oxbridge and a class system desinged to rear "natural rulers" with an entitlement to rule. Forget Suez, IMF, Scottish independence, Irish troubles. Especially forget Brussels bureaucracy, multilateralism, and boring diplomacy. The world needs us! 'Disabused' makes sense, perhaps your intention? You are, of course, correct. Edited and amended. ... is trusting the UK (not) to implement customs control in an efficient and "frictionless" way. The European Commission today warned the U.K. for the second time to recover 2.7 billion in lost EU revenue stemming from the country's failure to stop a massive fraud network that allowed cheap Chinese goods to flood into Europe. The Commission's warning is the next stage in the bloc's formal infringement procedure and follows up on findings from the EU's anti-fraud office OLAF that British customs played a central role by repeatedly ignoring warnings to take action over Chinese textiles and footwear entering the EU at a fraction of their cost of production. Oh, and the cherry on May's cake: The UK has two months to act or the case could be referred to the EU's Court of Justice. 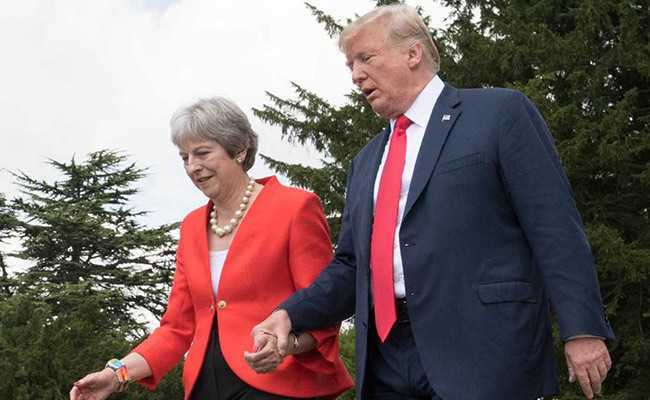 In response to a question from POLITICO on board an RAF Voyager plane on her way to New York, the prime minister said she would be able to maintain frictionless trade and strike "good, improved trade deals" with countries around the rest of the world. "Just think about this: If having those EU regulations stopped good trade deals, how come the EU has done trade deals with countries around the rest of the world?" May said. David Henig, a former U.K. trade official who was involved in U.S.-EU trade negotiations, agreed that a shared rulebook with the EU could cause problems for the U.S. trade deal, although it may not be terminal. "The U.S. agriculture people need to be able to export, they insist on their standards for export," he said. Nick Allen, chief executive of the British Meat Processors Association, said the U.K. has particularly high animal welfare standards and very prescriptive hygiene standards, and anything that means they have to compete with lower standards is a problem for them. Nevertheless, Trade Secretary Liam Fox has repeatedly insisted "there will be no lowering of U.K. food standards" in future trade deals. If Liam Fox says so. See my earlier comment in diary - PM May @BBC: My Deal or No Deal . U.K., so it will probably kill the deal." "A lady is not for turning ..."
Especially when you know it'll be for naught, in the end. Place Jo Cox has been inaugurated to the melancholic chords of a Balkan folk song and the anti-apartheid hymn Nkosi Sikelel' iAfrika as Brussels honoured the murdered MP in a ceremony attended by her family and the Labour leader, Jeremy Corbyn. The small corner of Brussels backing on to the Ancienne Belgique, a venue frequently visited by Cox during her six years living in the city, was packed with local dignitaries and politicians who had come to remember and watch as the new name plaque was unveiled. Cox's sister, Kim Leadbeater, addressing the crowd in the square, said she could still hear her sibling's "immortal words" on deciding to be an MP: "It won't affect your lives at all." Her sister's death at the hands of a far-right terrorist a few days before the 2016 EU referendum was still impossible to comprehend, Leadbeater said. "far-right terrorist"? Aren't you suppose to use the T-word only when the perp is Muslim (or Russian)? Word has reached us that the EU is now firming up its opposition to Chequers in such a way that we see little chance of retreat. Michael Barnier and his team have commissioned a report that suggests the long-term costs of Chequers to the EU would exceed the short-term costs of a hard Brexit. It is possible that the two sides still reach a deal? For one, events might intrude. The UK might have a new government before Brexit - unlikely but possible. The mood in the UK population might turn against Brexit in a way that has not happened yet. EU member states may change their position once they acknowledge the reality of a hard Brexit which they have not yet. Also, Barnier's calculations are based on the result of an economic model - the kind of which always overestimated the impact of the single market in the past - against actual losses of income and jobs. We keep noting reports, in the German media in particular, about a second referendum. A hard Brexit would come as a total shock. I find them rather stupid (for such smart people) on the Chequers cherry-pick. They seem to think that the EU should cave in, simply on the basis that May can't compromise any further (that is true, but is not the EU's problem). Finding a Brexit that May can sell to her Parliament is an impossible task anyway, and it is certainly not worth sacrificing the four freedoms to attempt it. I have been resigned to No-Deal brexit for some months. Not just because I doubted the competence of those doing the negotiations on the British side, but because I doubted their actual desire for anything other than No Deal. There have been too many unsubtle signallings from the powerful Disaster-Capitalists in both The City and their representatives in Westminster that a "No Deal" represented an incredible once-in-a-lifetime opportunity to make out like bandits and re-model, ie gut, an entire modern society, legally and financially, for their advantage. A still significant swathe of the population have been entirely fooled into thinking that life will be just fine outside of the EU and that we can, magically, return to the status quo ante of life before we joined the Common Market. That there are ships laden with produce from reliably white overseers in Commonwealth countries just waiting in the Channel for the go-ahead to enter port (to cheering crowds, presumably). That once we are freed from the leaden shackles of Brussels bureaucracy we will be entering the sunlit uplands of the lands of milk and honey from which we have been previously refused entry. And anything that goes wrong will not be the fault of those who lied to them over a generation into securing a "leave" vote. No, it will be those sneaky dark skinned furriners across the channel, many of them french and smelling of garlic who have double crossed us yet again.